GEMINI's team of highly skilled architects and engineers are armed with excellent academic background enriched by years of experience designing a wide range of high value buildings including Palaces, Mosques, Hotels etc. M/s Praxton Impex Pvt. ltd. is setting up its IT Office building in Panchkula IT Park. Consultancy - Architectural, Structural, Electrical, Public health, Fire fighting & HVAC etc. 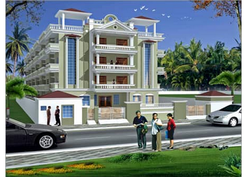 Location & Area- IT Park, Panchkula & 7490.78 Sq.mtr. Architecture design and consultation for Private Residences, Villas, Group housings, educational Institutions, commercial & Industrial buildings. With vast industrial expertise and affluent knowledge of this arena, we are readily instrumental in providing world class service for Architecture Design Consultancy. As per the detailed desires of our clients, these presented services are broadly cherished. In addition to this, these could be altered as per the varying desires of our clients. Being one of the renowned business names guided by assiduous and capable personnel, we are engaged in rendering services for Architectural Design Consultancy. Provided services are delivered beneath the backing of nimble personnel who have massive experience in this sphere. In addition, these services could be acquired from us at enormously reasonable costs as per our clients varying needs. We are one of the well-known firms of Architectural Design Consultancy Service. Our offered service is accomplished by industry certified experts who have opulent acquaintance. This service is extremely accepted in the market owing to their timely completion. We render this service in diverse terms and forms that meet on clientele demand. - Design of services such as Electrical, HVAC, BMS, Access control etc. Nele is a leading New york based software development outsourcing company which is setting up its IT Office Building in Panchkula IT park. Consultancy- Architectural, Structural, Electrical, Public Health , Fire Fighting & HVAC etc. We offer architectural design consultancy right from drafting to designing projects. We have a qualified team of architects and civil engineers with vast experience in execution of huge real estate projects.